The New Forest Nature Reserve is the smallest National Park in Great Britain. It is the home for the New Forest Ponies which can roam freely and follow their natural way of life. The New Forest was founded in 1079 by William the Conqueror and is located between Southampton and Bournemouth. The management of the Park easily discovered the potential value of the New Forest and therefore the tourism completely is established. This effected a further limitation of the horses’ freedom but at the same time it became easier for us to visit and observe them. The New Forest is a great place for a whole holiday where you experience the harmonious way between nature and horses. The ponies live in a nature reserve which offers more than 300 km2 of pastures, forest and head. They share the habitat with other animals like cattle and small mammals. In the whole Park there are fences which prevent a possible escape of the animals. The small villages of the Park are connected by several streets. Even if it is forbidden to drive faster than 40km/h often there are accidents between cars and horses or other animals. In some cases these accidents lead to the death of the horse. The principle rule is: Animals have right of way! A horse in the middle of the street which does not want to move from its place is a typical situation in the New Forest. If this makes you crazy you are wrong in the Park. Many things in Great Britain are organized through a traditional operating system. This also fits to the management of the New Forest. The whole management can be separated into three main groups of work. On the top there is the Verderer. The name comes from the former royal organization and in the history the Verderers were responsible for the former hunting areas of the crown. In the New Forest there are ten Verderers which determine the Common Laws and control their execution. Additionally they manage the common register for the wild horses and have an overview of the total horse population and the stallions. On the next lower step of the hierarchical organization there is the Commoner. His job can be compared with the job of a tenant. They buy areas and then the horses which live there become assigned to the respective Commoner. You can identify the Commoner of every pony through the owners’ brand on the horses’ hind leg. Commoners pay an annual fee and from this fee also the third group, the Agisters, get paid. This group of workers has the real contact with the animals. They maintain the size of the herd and control the execution of the common laws. Moreover they offer medical care for old and ill ponies and they are one of the first persons at the scene of an accident. The Agisters get paid by the Verderers. If the Agister received the payment he clips the tail of the pony. This is an old tradition and demonstrates the receipt of the payment. The New Forest Ponies are semi wild. This means that they can live in an undetermined and pure way but their habitat is limited. If the Park wants to guarantee enough of natural nourishment and water the population of the herd cannot become much bigger than the current number of about 3000 horses. Referring to this the natural reproduction needs to be regulated. Stallions are only let out to the herds from April until July. After a gestation period of eleven months the foals get birth in spring and summer. Verderers guarantee a healthy and pure breed and for this reason they change the stallions every three years. According to this they organize one of the biggest horse auctions in the whole country. The Beaulieu Road Pony Sale takes place several times a year. A further measure to control the size of the population is the drift. Commoners and Agisters round up their herds in a big and fenced paddock. Then they make some healthy checks and take out the horses which will be sold at the Beaulieu Road Pony Sale. Since some time these drifts are not public anymore. In the past a huge number of visitors often obstructed the work of the horse owners. A medical care could not be guaranteed anymore. Therefore you need to inform yourself about the dates of the drifts before entering the New Forest so that you do not accidently obstruct them. The New Forest Pony is a muscular pony and can reach a hands high up to 148 cm. However in free nature you rarely see a pony which is higher than 130 cm. The elegant head refers to the former breed crossing with Arabian horses. Due to the long but not too massive neck, the strong back, the long legs and the short fetlocks the whole outward appearance seems harmoniously. In general all colors of coat are permitted but bay and chestnut are the most dominant ones. In opposite to this any kinds of piebald and blue eyes are forbidden. 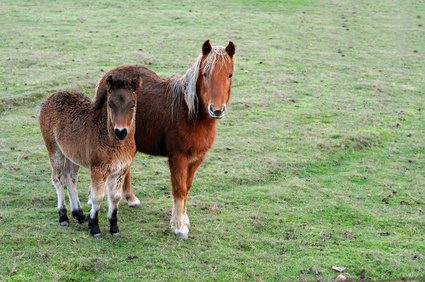 The New Forest Pony grows up in the wild nature and therefore is really robust and though. In general one can describe the character as good-natured, persistent, and calm. Due to its willingness to learn and reliability it can be trained for many different disciplines like show jumping, coach and of course Polo. Additionally in the past the New Forest Pony several times was trained really successfully for handicapped riders. It is a real all-rounder and can be ridden by children or any kind of beginners. The New Forest Pony is and shall stay a wild horse. This means two things. Visitors need to be aware of the danger of a wild horse which can kick or bite at any time. Furthermore the wild horses shall not become used to humans because then they could easily become dependent. The principle of the park is: observation yes, touching and feeding no! Due to foggy weather and too fast driving there often are car accidents in the New Forest. Horses get wounded or even die. In general you commit an offense if you do not inform the Park Management about the accident. Additionally it is recommended to buy an “animal emergency hotline card” before entering the Park with the car. On this card you can find all important numbers which you have to call in case of an accident. There is a variety of different possibilities to explore the Park. Visitors who prefer a comfortable way can take a ride in double-decker. The tour leads trough all of the small villages in the park including Beaulieu, Exbury, Lymington, Brockenhurst and Lyndhurst. Every town offers a cozy little city centre and additional sights. Active visitors can explore the Park by bike or kayak or simply walk. The whole reserve offers many different tracking ways and many sings make sure that you do not lose your way. It is permitted to leave the normal ways and if you walk besides them it is much more likely to observe the wild horses. For all horse fans there is the great possibility to explore the nature reserve by horse. There are plenty stables which offer horseback riding in the Park. This indeed is a unique chance: Imagine that you observe the wild horses from the back of a horse! Here you can find a list with all the stables. Besides the unique nature and the observation of wild horses the New Forest offers several other sights. One of it is the Exbury Garden. This is a huge garden with rhododendrons in all possible colors. But even if this beauty is a real natural spectacle you should never forget how poisonous rhododendron is! Because you can never be safe from rainy days in Great Britain it can always be a good alternative to visit the National Motor Museum in Beaulieu. You can easily reach the New Forest by several ways. The train from London Waterloo only takes 90 minutes. If you arrive from a foreign country you can fly to Southampton and start your journey there.